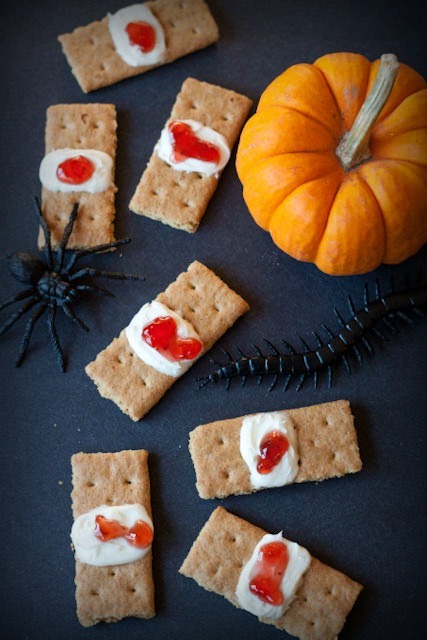 Halloween Bloody Bandage Cookies and a Giveaway! It is officially my last week here in Massachusetts. And it’s strange. Exciting and wild and cluttery, but yes, strange. Bittersweet. It’s sort of timely that Halloween falls squarely in the middle of the chaos, because why not? Let’s make things creepy while we’re packing. Or at least, let’s use the candy as fuel for the move. In between ten-minute spurts of wrapping my dishes in my sweaters and stealing bottles of conditioner from Mom’s closet, I wanted to take just a minute to celebrate the holiday. Now, I didn’t have loads of time to spare, so I looked for something that met these three criteria: quick, easy, and festive. Emphasis on the quick and easy. Oh! Forgot to mention that it had to be cheap. Frugality was key since I’m moving to Manhattan in 3 days and, honestly, that city owns me now. The sweet recipe that I chose came from one of my favorite places to spend twenty minutes: the Dollar Tree. Now, a few weeks ago I found myself in the thick of an intense crafting and DIY-ing spree (refinishing a second-hand kitchen table, spray-painting cheap wall frames, reupholstering the seat cushions of two antique chairs with more modern fabric…). It was a mission to decorate my apartment on a shoestring budget. Naturally, I wandered in and out of Dollar Tree a time or two. What I discovered only very recently, though, was the online side of Dollar Tree, and their Value Seekers Club, a community that you can join (for free) to receive emails with bargains, new product sneak peeks, craft/recipe/décor project ideas, and contests. It was up my alley. The content is always changing and one of my favorite features is that you can save and print project sheets—making it easy for me to bring a shopping list to the store. These festive bloody bandage cookies are taken straight from the Value Seekers Club. All of the Halloween craft and recipe projects that I browsed had step-by-step tutorials, which made it easy to know right away whether they’d take five minutes (and five dollars!) or thirty minutes. 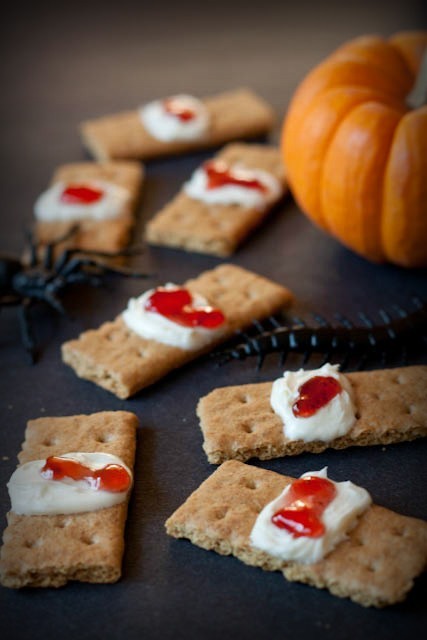 Since most of the eats around Halloween are hyper-sweet, these are refreshingly mild. They’re just honey grahams with a smear of vanilla frosting and a dab of strawberry jam. Three ingredients. Three dollars. Done. Kids would LOVE them, and [should act more like] adults like me? Might love them even more. Maybe you’d consider picking up a box of bandages (as Dollar Tree suggests), a small bag of cobwebs, or plastic spiders for additional props. Otherwise, this couldn’t be simpler. I put these treats out before a Halloween party I went to last weekend and they were such a hit. If you want to get the super-quick recipe for these cookies, or to see what other projects and deals Dollar Tree has to offer, head here: Dollar Tree Value Seekers Club! It takes no time to sign up with your email and the recipe is on the main page along with a whole mess of other crafts and recipes. November’s content goes up on Friday, so be sure to check out October’s finds before it is too late! I bet the upcoming holiday season is going to bring lots of cute ideas to my inbox. Leave a comment below stating which project from the club you want to try first! Please use the same email address when signing up for the Value Seekers Club as you do when leaving your comment so that Dollar Tree can verify your membership if you win. I’ll randomly pick a winner by the end of the day on Friday, November 1st! Good luck! Glass Jar Monster Faces – so cute! Wish I had seen them a couple of weeks ago so we could enjoy them longer! It really is a scary move to NYC Andie. Please keep your wits about you in the city. I am sure you will be fine. Still it is better to say it and give you good blessings than not to say it. Guess I have been watching too much Law & Order. :-) But I am sure with your culinary skills you will always be in safe company. But watch out for those kitchen knives. :-) Happy Halloween. As Andie’s mother I am in total agreement with you about safety. Despite the fact that I grew up in Boston (Jamaica Plain to be exact) I lived such a sheltered life as my dad was a correctional officer at Deer Island Prison and kept his nine children close to him at all times. I want Andrea to carry a very pointy umbrella rain or shine and will consider getting her two german shepherds, one for each side of her. Andrea is very street smart though and when visiting her in Italy (during her semester abroad) I was amazed that she was strong and did not let anyone bother her, she is very friendly but is extremely perceptive and knows when someone is feeding her a line. Maryellen I am so glad you feel the same way. Love the part about the pointy umbrella. :-) Like you said I am sure Andrea is more than capable and knows when she is being given a line. Sometimes the difference between normalcy and disaster is just seconds. So one has to be aware of what happens around you. I find that if I am forceful about being careful especially to my mom and sister, they tend to think about it and be more self aware. It is also why I survived some of the most dangerous places on earth. I grew up in Brooklyn (didn’t leave till I was 50). NYC isn’t really all that different than any other large city except there are more people. If you are aware of your surroundings, everything will be fine. Actually, the people in NY are friendlier than where I am now (won’t say exactly where but it’s in the south). Take comfort in the fact that NOTHING on Law & Order is real. New York is probably safer today than the majority of most American cities. I honestly felt safer in the Bronx than I did in Chinatown in Boston (I’m from MA too.) It’s jam packed with people 24/7, well lit, “clean”, the subway runs 24 hours a day and there is always a restaurant/bodega/shop to duck into if you should run into trouble, which you won’t, unless you are looking for it. Andie- your move will be GREAT!!!! I went to NYU and stayed for two more years until I met my husband and we moved for more space. But I would go back in a heartbeat, and hope my children feel the same way someday. Here’s to an incredible, life changing experience for you. Enjoy!!! Agreed! I grew up in the Bronx and currently live in Manhattan, and it’s very safe–Definitely not the way it’s usually portrayed in those TV shows. Like every other big city, there are areas to be wary of, but on the whole, NYC is known as the safest big city. 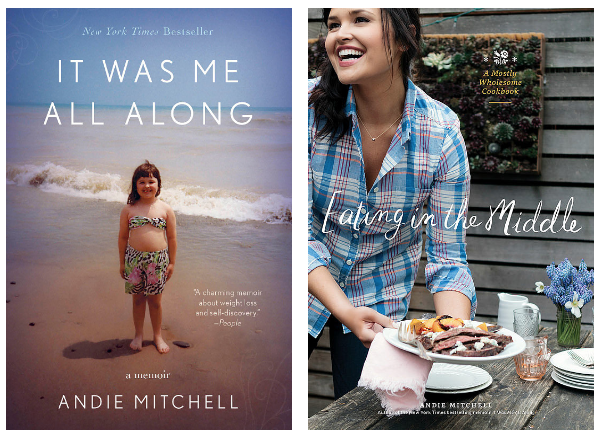 Hope to see you around Random House, Andie! The Fall Leaves Wreath. I’ve been looking for a festive door wreath that wasn’t labor intensive or pricey. Most ideas I find on Pinterest take $50 in materials. This one looks easy and affordable! Thank you for the post. As a home school mom, I am always looking for affordable crafts . We will be making the stained glass leaves this week. Really cute! There’s a lot of great ideas, but being the foodie that I am, I will probably make the chocolate cheesecake dip or the PB&J cookies. Thanks for the contest. I could get all my Christmas shopping done for a hundred dollars at Dollar Tree! :) Good luck on your big move! Cool, NEVER knew about the online option. LOVE your treats!! I creat handmade art (whimsicalcreations.blogspot.com), so their fall printable sign would be FANTASTIC to print & spice up!! Thank you!! I love the Fall Family Trees! What a neat idea, and who doesn’t love getting a little paint on their hands!? I love the fall leaves wreath. What a great idea for the season! This is great, I never even knew about this site. I think the Tabletop Turkey project would be a fun one for the younger kids. I also love the Best Brownies Ever recipe – looks yummy. I would love to try the chocolate chip cheesecake dip! I have a football party this weekend and need to take a dish to pass! This sounds delicious and easy! My kids would love the Chocolate Cheesecake Dip. I want to try the PB&J cookies, they look delish! The craft ideas are great too, but I always gravitate towards the food. Good luck in NY! I love the tabletop turkeys! I think the little boo bats are too cute. Chocolate chip cheesecake dip? HECK YEAH!!! I love love love Dollar Tree. I spend way too much money there. The chocolate chip cheesecake dip sounds yummy! Paper bag popcorn turkey!!! What a cute idea! I like the little bats…Next year I will use them on a wreath. No time to do it this year. Add a few little ghosts and will be the cutest!!! Have a great move and be safe. I’m going to try the Tail Waggin’ Treats. Those will make great Christmas presents for my friends with dogs! Without question, the paper bag pumpkins! Cute! I love the dollar tree! I’m going to make the paperbag popcorn turkey. Such a fun idea! The ‘best brownies ever’ recipe sounds awesome! I loved the popsicle stick table runner……would be fun to do with the Grandkids. Fall Family Trees looks fun & a good way to mark the passage of time – watch the trees get bigger with the little ones! How funny that we’re both making Big Moves the same week! Best of luck in NYC, you’re gonna rock it, girl! Tail Waggin Treats! My little lady, Molly, deserves the best!!! Funny you should write about Dollar Tree in your blog, my dad is obsessed and I get him a GC every Christmas! Best wishes to you on your move!!! You’re going to do great! I was going to say the popcorn turkeys, but the pilgrim hat treat cup is spectacular. P.S. Best wishes on your move to Manhattan! Good Luck with the big move, Andie! Moving really bites no matter what, but I can only imagine how difficult it will be to move to NYC! I didn’t even know that dollar tree had an online craft site, thanks for letting us know! The project I want to work on first are those cute tabletop turkeys. I think me and my boys might be trying this very soon! The bloody bandages, of course….I’m a nurse! The Tabletop Turkeys! Perfect for the upcoming family Thanksgiving gathering! I would do the Tail Waggin treats because my girl loves pumpkin and peanut butter. I’m ready for the chocolate chip cheesecake dip. Tasty. Easy. That’s right up my alley. Monster glass. Fun project for craft night. The paperbag pumpkins are adorable and would be great to set in my office at work. Best of luck in Manhatten and with the move! I would like to try the Monster Luminaries! I am a member of the Value Seekers. Thanks for the chance to enter. I would like to make the Paper Bag Popcorn Turkey. Thanks for the chance to enter. What a great contest! Thanks! I love the popcorn turkey. Good luck in NYC!! I think the chocolate chip cheesecake dip sounds delicious and would be perfect at a tailgate on Saturday. I would have to go for the chocolate chip cheesecake dip! Im all signed up! Id like to try the Bat treat holders! The Tail Waggin’ Treats are what I’d make since you know what’s going in them, not like some of the other dog treats out there. 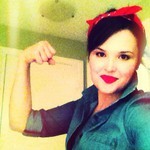 Haha, my (then 17 years old) daughter and I were both Rosie the Riveter last year. We went to different parties of course! Good luck on your move! I want to try the glass jar monster faces or the easy pb and j cookies. Love your site. Hi- welcome to Manhattan- not sure what area you are moving into but like so many cities NYC is a cluster of smaller communities. It really is not as bad as people make it out to be! I am in East Village and have my share of edgier people plus artsy people and NYU students. Great place to live!!! I want to make the witch finger cookies! too cute my nephews will love it– I am also going to see if I can craft one into a football for game days. That popsicle stick table runner is so cute! Definitely want to try that. The Fall Leaves Wreath looks fun and easy. Thanks for the great giveaway! The “Best Brownies EVER” recipe needs to get made asap! Holy yum:) Thanks for sharing this site…Dollar Tree is my favorite store!!! Im going to make some of those tabletop turkeys for our thanksgiving table…so cute! Thank you for letting us know about the Dollar Tree website. The chocolate chip cheesecake dip sounds wonderful. Will make a batch and take it to work so we won’t eat it all! Love reading about you and your mom on her quest for healthy living. Much luck to you in your move and to her continued weight loss. The Fall leaf wreath. Good luck with your move- sounds scary but exciting! So excited for you! I almost, almost went to grad school in New York, but chose another school instead. You’ll have so much fun there! P.P.S. – Also, I’m definitely in for the contest (and the club) because they have the best and cheapest beer steins to personalize. It was one of the first posts I ever had on my blog! Definitely want to try the popcorn turkey! Aside from making turkeys cut out from a child’s hand, it can be tough finding a fun Thanksgiving day craft. Plus, my son loves popcorn! Good luck in Manhattan! Anytime I visit, I throw a tantrum when it’s time to leave. Love it there, and I know you will too! I just joined value seekers and I cannot wait to make the bathroom tower project!!!!!!! My counter is rather small and this will give me the option to buid UP! Thanks ! Love your blog it is my getting healthy inspiration! I would definitely like to try the Best Brownies Ever! Although the popcorn-stuffed turkey looks hilarious. The Bathroom Tower looks like a great idea, especially with 7 children in our family, 5 of them girls. As girls grow into teens, they need more space for their toiletry stuff. This is a cheap, pretty way to do it! Hope we win! Love your blog! Thanks for your inspiration and recipes. Also, enjoy NYC. I grew up in the Bronx, my husband is from WI and we met in the City. It can be scary, but it is also so much fun, and such an experience. I don’t live in NYC anymore, but I think every place has it’s benefits. Have a good move! The pilgrim napkin rings are amazing. I honestly probably won’t even wait until Thanksgiving – we’re going to use them Sunday at our weekly community dinner. And I’ll be honest – I actually didn’t expect this little newsletter to be so terrific – I usually find store “newsletters” a little hokey and self inflating, but the Value Seekers Club is awesome! I may have to try to skinny down the Best Brownies EVER recipe…looks super delish! Bathroom Tower!!! To hold toiletries, etc. for holiday out of town guests. Also a great space saver, and something that would probably help in your new NYC digs. Hope all goes well with your move! I would start making the Fall Leaves Wreath first. Thank you for the opportunity to win! I would start by making the Fall Leaves Wreath first ;-) Thank you for the opportunity to win! I would make the Fall Leaves Wreath first! It’s so cute and perfect for my fave time of year! OOoooooh, defintely the brownie recipe. It must, without a doubt, be something chocolate. Andie I wish you the best in your new adventure in New York. I’ve never wandered any further than Florida and can’t imagine living anywhere else. At least you’re already used to the freezing cold winters and snow, so that’s a big plus. I would like to try the paper bag popcorn turkey. the bathroom tower! That’s too simple and cute! I definitely need to make the bathroom tower! My boyfriend and I just moved in together and woof-we need some storage space. I hate when there is no post for the week. Oh I suppose you are “busy” moving and “starting a new chapter of your life.” and whatnot. sigh. :-) jk – love ya! I know this must be a strange week for you–full of pride, encouragement and hope for Andie as well as one tinged with sadness and grief as you feel her absence. The dualities of motherhood, pain and joy intertwined like a DNA helix. So glad to hear that NYC is fun! But, the suspense is killing me, who won the gift certificate??? I want to try the S’mores bars!